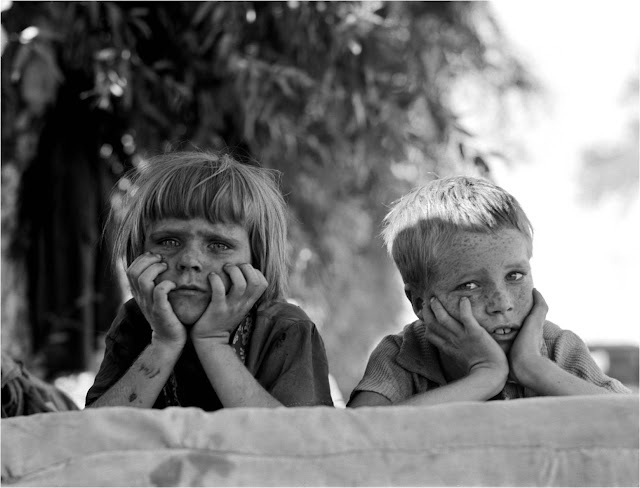 A look at the work of Dorothea Lange who captured the Great Depression through her lens and created some of the iconographic images of that era. 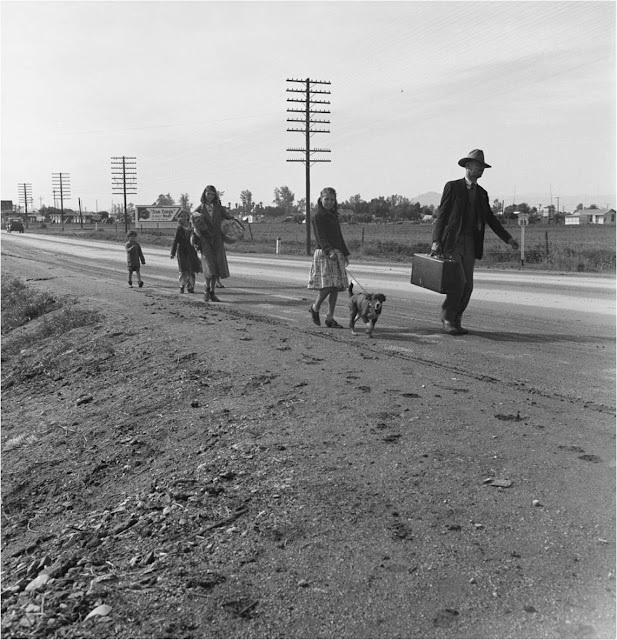 At a time when women had had the vote for less than twenty years, Dorothea Lange was a pioneer. A professional woman who took photographs for a living. 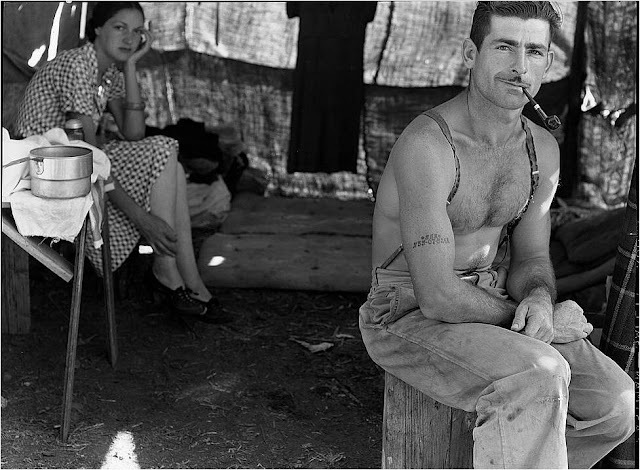 The Great Depression of the 1930s is best remembered, photographically, by the work of the FSA, for which she worked. She travelled the USA recording the deprivations caused by the failure of the economy as well as taking many uplifting images that showed that, despite the hard times, life and love went on. It is probably best to start with an image of the photographer herself. Unlike some, Lange did not interpolate herself actively in her photographs – those that we have of her show her usually on her own in very much a framed composition. 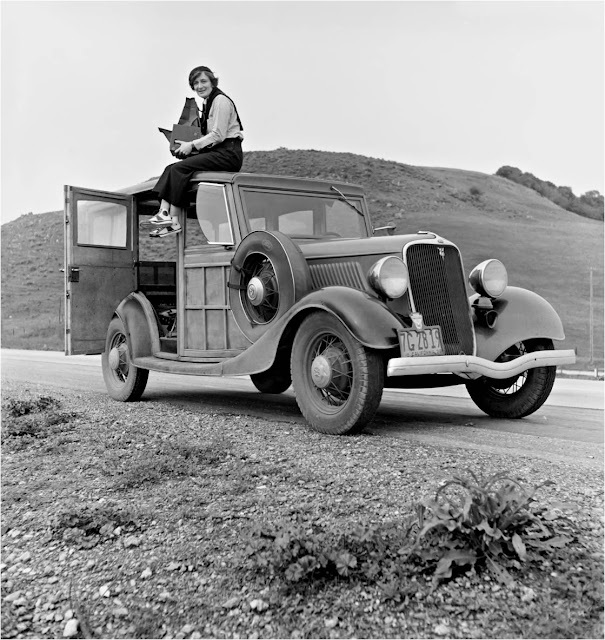 This shot from 1937 shows her in the field with one of her cameras, rather coquettishly positioned atop of her car. Short dark hair and a feminine yet somehow boyish dress sense, the beauty of this shot lies in the baseball boots she is wearing. Her job was not, after all, one that required heels on any sort so why bow to the fashion dictates of the time? This remarkable image looks so clear and modern, as if a young woman from 2011 – with the stick thin figure to which so many aspire, has taken to a little game of dress down for the day. 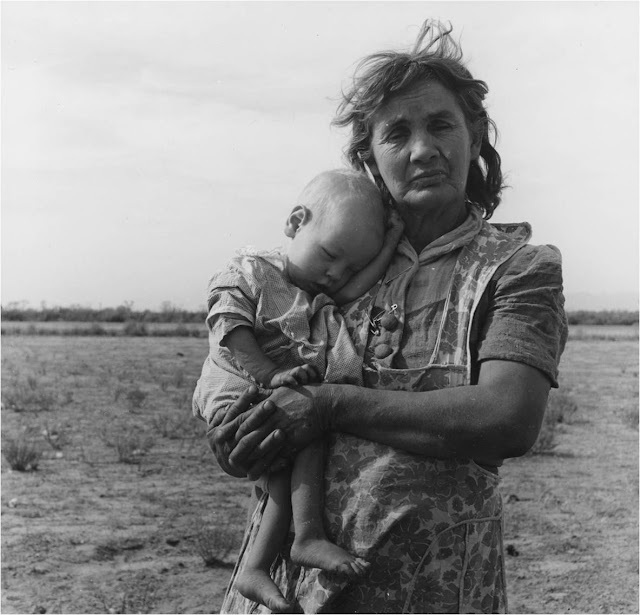 In fact this young Texan mother had travelled thirty five miles each way to pick peas. For the five hours each worked they earned – in total - $2.25. With two young children to feed, how far would that go? Her figure is more likely down to the sacrifices she had to make rather than a diet. Lang’s best work is in portraiture and this is little surprise. 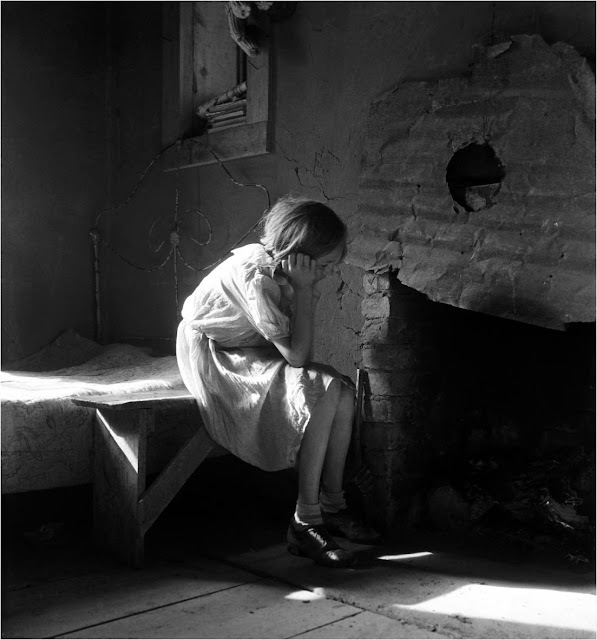 When the Great Depression came Lange was already an established portrait photographer but the severe economic downturn led to her focusing her attention away from the studio. Lange took to roaming the streets taking pictures of homeless and unemployed people and this very quickly drew the admiration of local photographers. 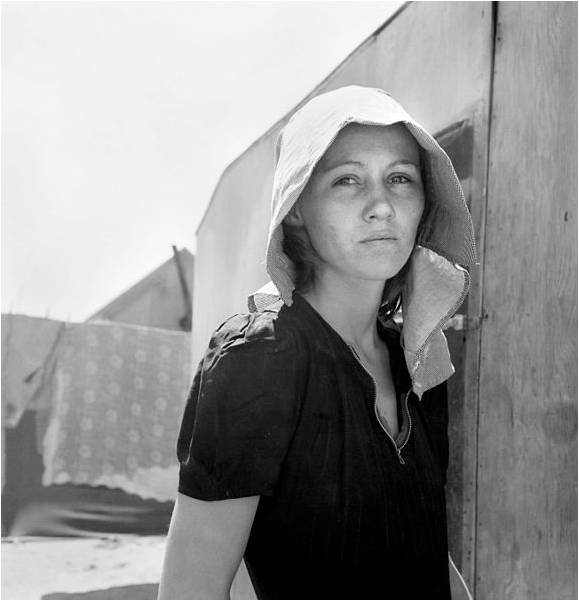 One thing led to another and she found herself employed by the rather harshly named Federal Resettlement Administration, later to become the Farm Security Administration (FSA). 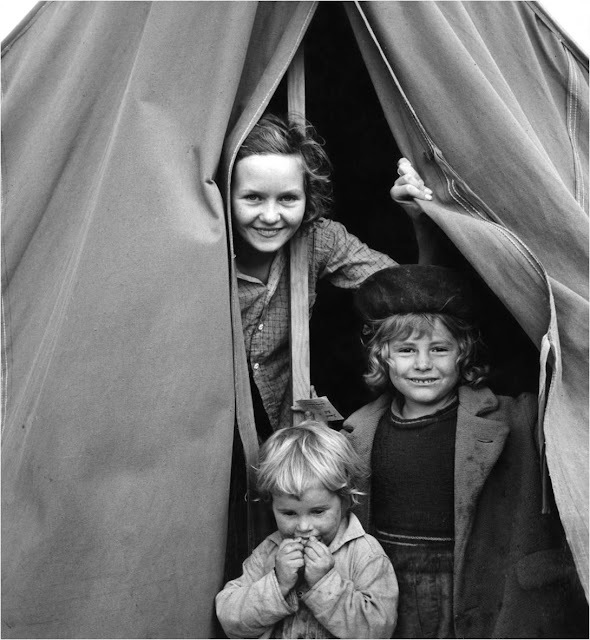 Her job was to capture the lives and times of those affected by the Depression and to pass these images on – free of charge – to newspapers and magazines. It wasn’t entirely all doom and gloom, however. Even poverty is overcome by joie de vivre on occasion. 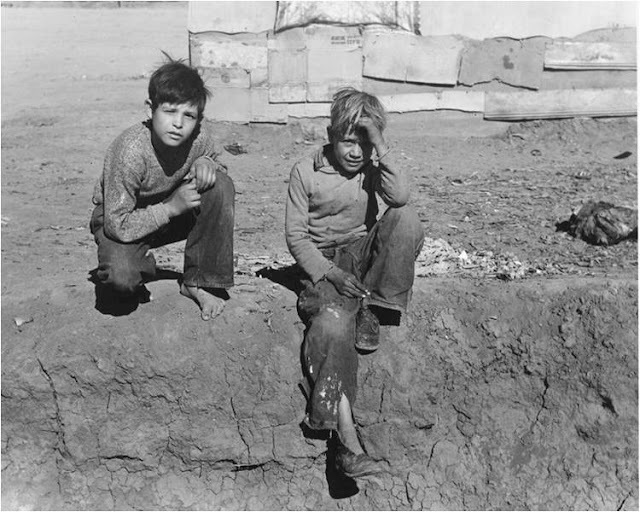 Yet the FSA did need some happy shots – the clothes of these children are testament enough to the financial state of their families. 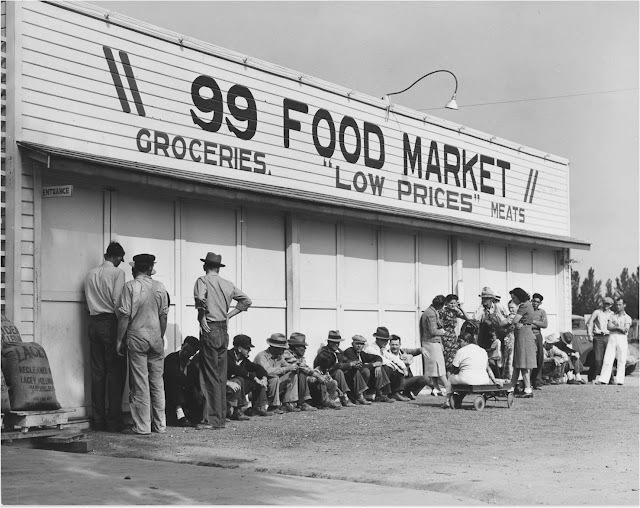 The FSA was set up to try and combat rural poverty in the USA. It was committed to buying up submarginal land owned by poor farmers and to resettle them on group farms with better land. It may sound a little like socialism to our modern ears – and it is true – the FSA was hugely criticized. 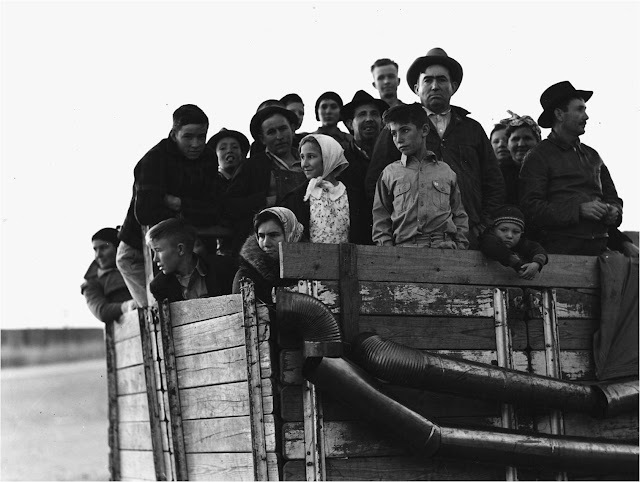 Many saw it as an attempt – a la Joseph Stalin – to collectivize farms. The FSA was doomed to failure, but at the hands of the farmers rather than the Government. 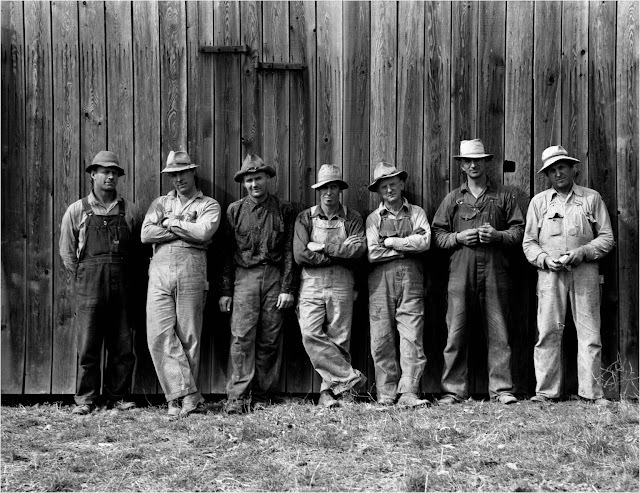 The farmers wanted full ownership of their new land – Americans could, after all, still dream. As soon as the Conservative Coalition became the dominant force in Congress in 1937 its days were numbered. 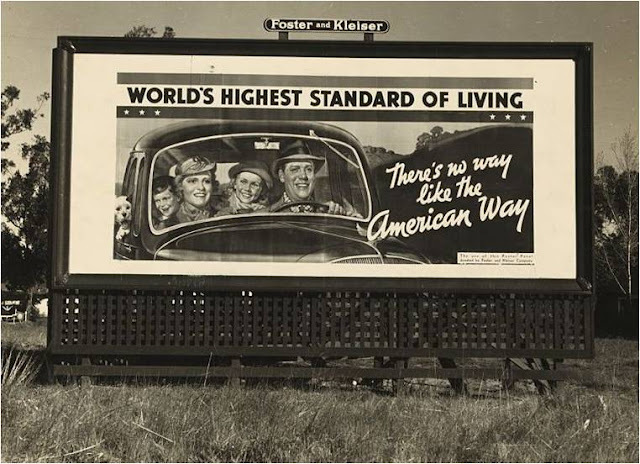 Lang’s photographs show that she had a good understanding of irony, such as the1937 shot of a bill board above, advertising the good life in California where life for farmers was anything but. However – and it remains true today – there are always some who benefit from recession. This remains a rather idealized portrait of American family life in the nineteen thirties but still is a poignant reminder of the aspirations of its people. 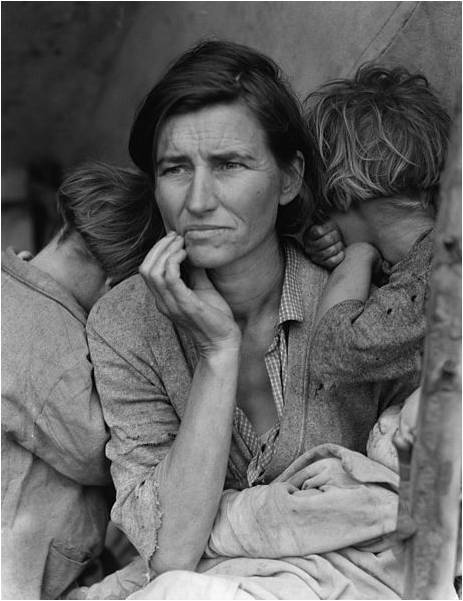 This is Lange’s most celebrated and iconic portrait of American family life of the thirties and an image that stays in the mind for a great deal of time, such is its power. 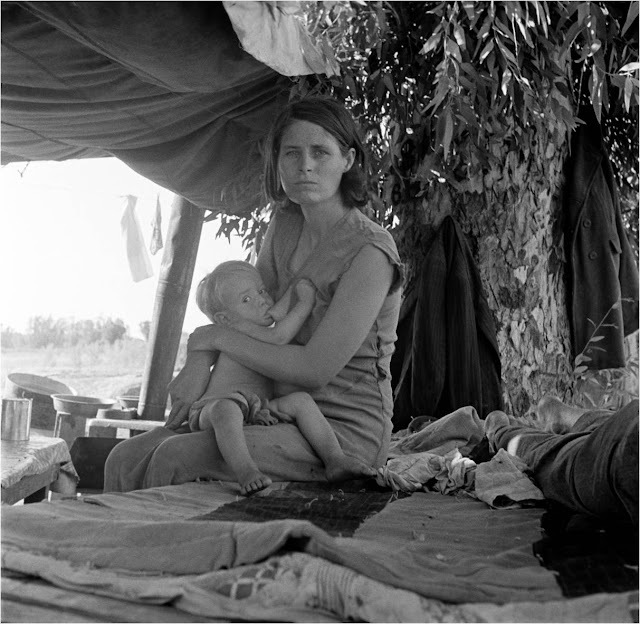 The subject is Florence Owens Thompson and the name of the photograph is Migrant Mother. In Lange’s own words ‘I did not ask her name or her history. She told me her age, that she was thirty-two. She said that they had been living on frozen vegetables from the surrounding fields, and birds that the children killed. She had just sold the tires from her car to buy food. There she sat in that lean-to tent with her children huddled around her, and seemed to know that my pictures might help her, and so she helped me. There was a sort of equality about it.’ Some of this has been slightly disputed by Thompson’s son but the image remains a portrait of strength in adversity, of a moment of quiet, desolate thought in a desert of hopelessness. A startling juxtaposition of migrant workers and a billboard advertising the American Dream which had gone so wrong for so many. 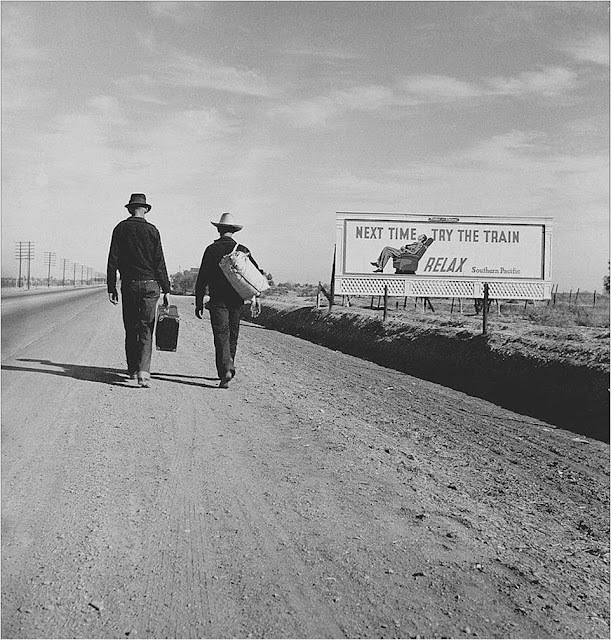 As the men trudge towards San Francisco, carrying possibly everything they own, the poster exhorts them that next time they should really consider taking the train. A photograph taken ten minutes later would have, one hopes, have shown the billboard in flames. 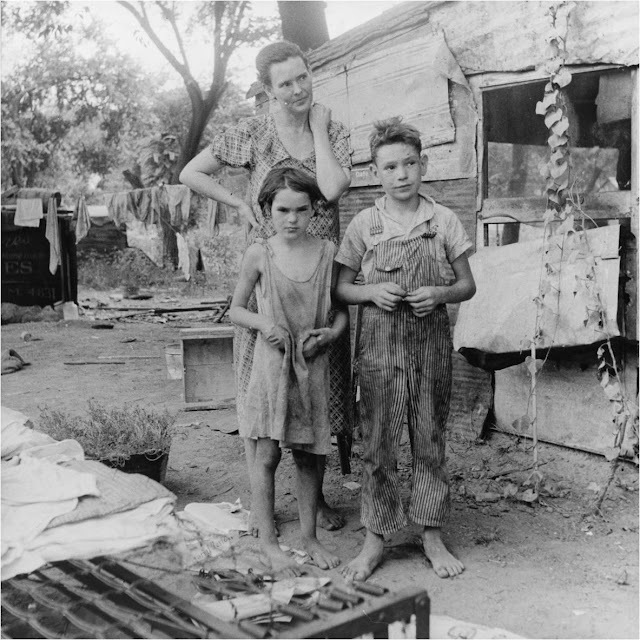 It is this sort of imagery though, that married with the written works of Steinbeck, Evans and Agee created the image of the USA during the Depression that we still associate with it today. 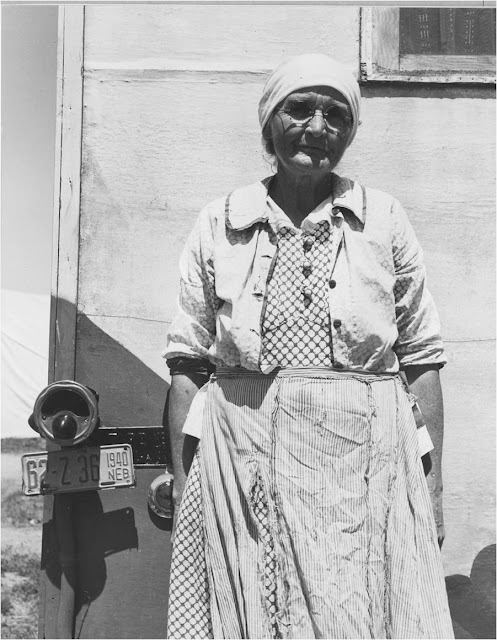 The older people that Lange photographed open up, in the faces, times past. 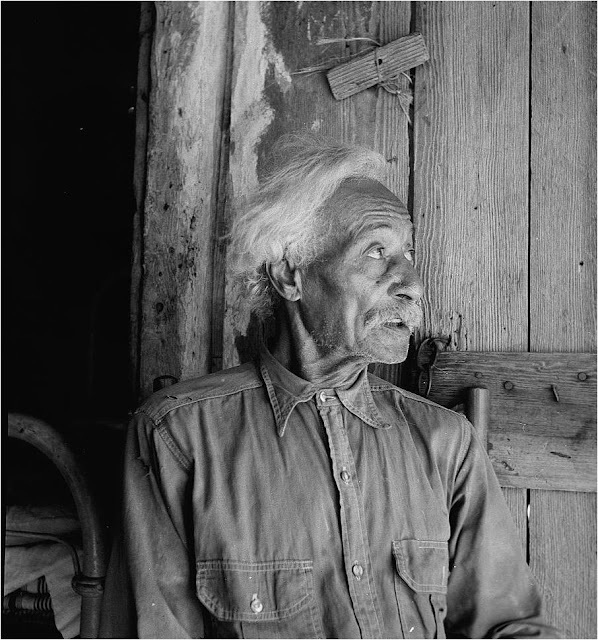 This is Bob Lemmins, taken in Carrizo Springs in 1936 at about the age of eighty five. His is a story of those times. He arrived in Carrizo Springs with his then master and others during the American Civil War. The only African-American in the group, they were looking for new ranges for their cattle. He settled there in 1865, the same year Lincoln was shot and the civil war came to an end. 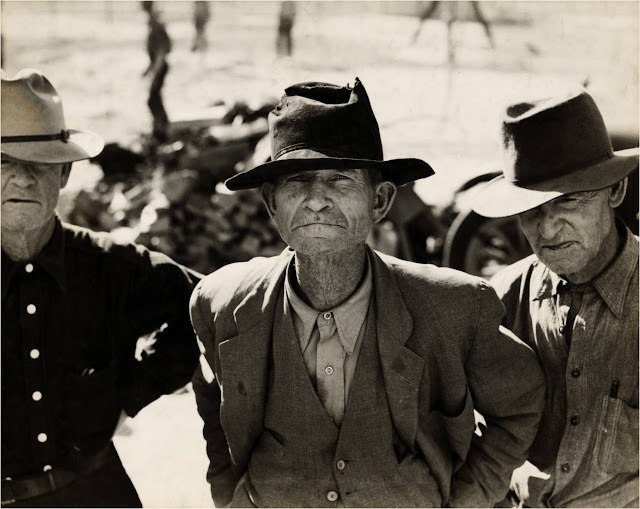 Whether or not he was being completely truthful o was using the hyperbole of old age, Lemmins maintained that he knew Billy the Kid personally – as well as many other reprobates of the time. With their film star looks and insouciant demeanor this couple might just as well be two actors taking a break from filming a Steinback novel. 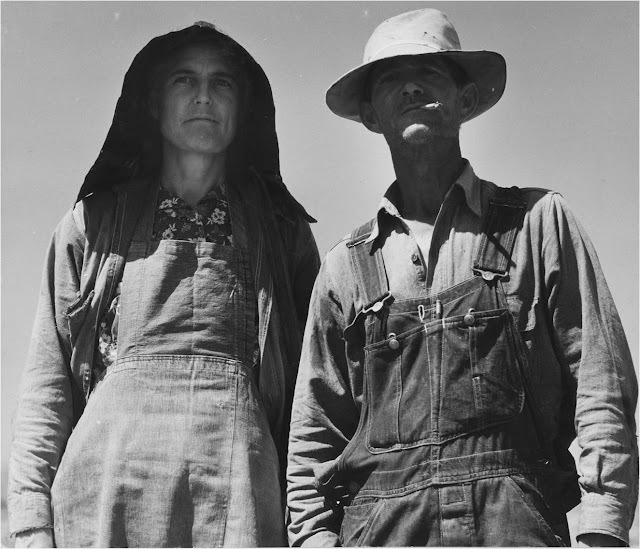 In fact it is an unemployed lumber worker and his wife en route to the 1939 bean harvest. 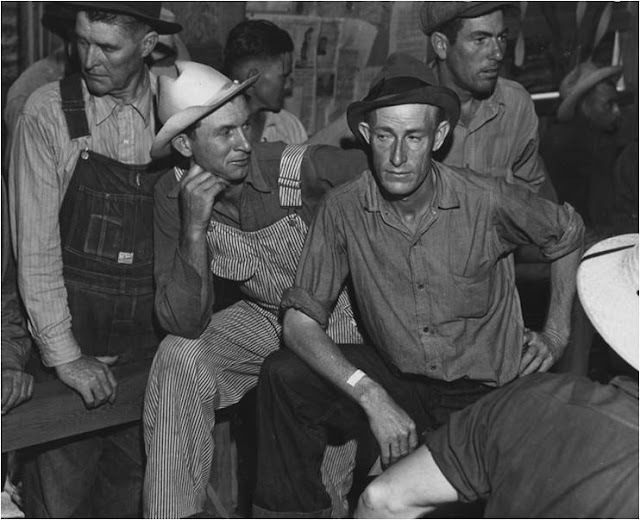 They look relaxed and healthy – but were likely exploited as migrant laborers and paid a pittance. No doubt either before or after this shot was taken they were interviewed by Paul Schuster Taylor. He was Lange’s (second) husband and was an Economics Professor at Berkeley. He was a source of much information to Lange, socially and politically and shaped her views. 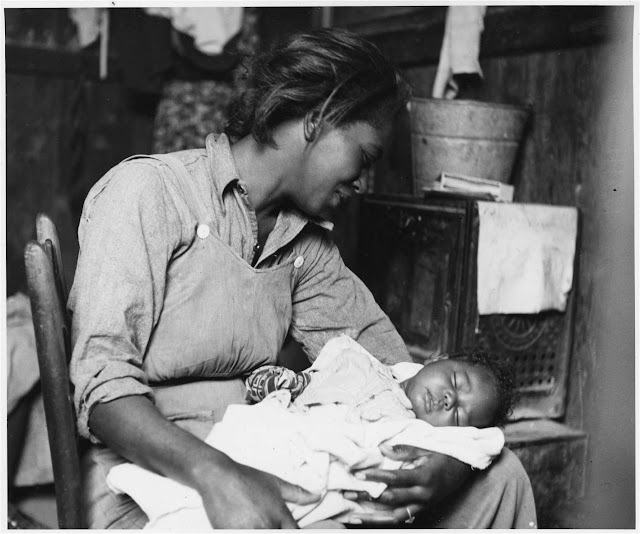 Professor Taylor interviewed many of the subjects of Lange’s photographs – which is why we have information about them – and gathered up data about the sharecroppers and migrant workers which is still referred to today. 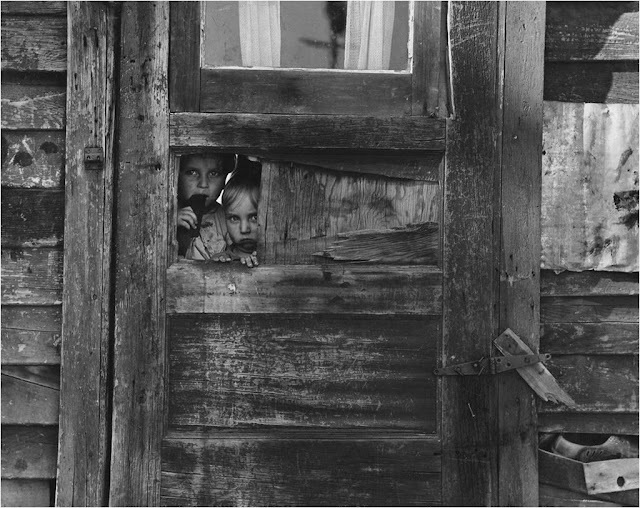 Two children and the wooden shack that they call home. It is quite possible that these two tiny subjects are still alive, though each would be in early eighties. 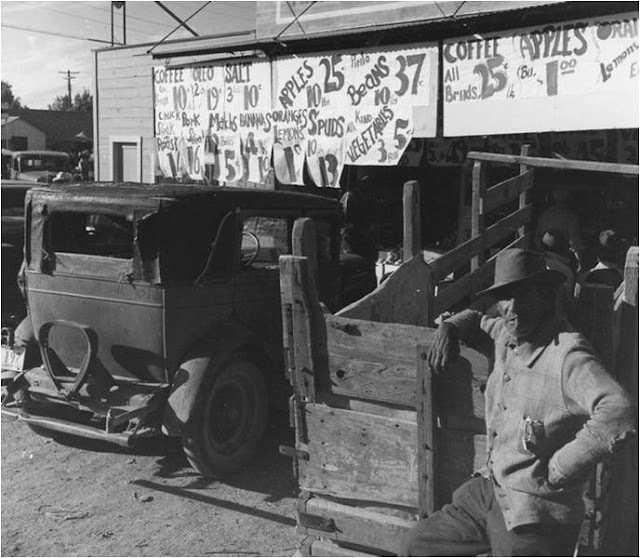 It was taken in early 1940 near the tellingly named Weedpatch. The rent for a week was $2.75 plus electricity. Take in to account that a short time before the woman in the first picture and her husband together earned twenty five cents less than that for a whole day’s work and you soon begin to realize how this particular cycle of poverty was close to impossible to escape. The real Grandma Walton. Although her name is unknown we do know that she was seventy when this picture was taken. Instead of enjoying a comfortable retirement she found herself a migrant worker together with her sixty eight year old brother and her sister and nephew aged sixty five and thirty respectively. What became of her will never be known. One can only hope that life became kinder for her towards the end of her days. The Depression affected the very young as well as the old. This perfectly framed Taken in Maricopa County, Arizona; this shows a migrant cotton picker and her child. This image is particularly affecting as it shows that hope – like new life – springs eternal. The household is at the very best rudimentary but this woman has managed, despite everything, to keep herself and her baby clean and healthy. The smile directed at the child rather than the camera shows the sublime and enigmatic happiness of a mother facing hardships many of can only imagine. 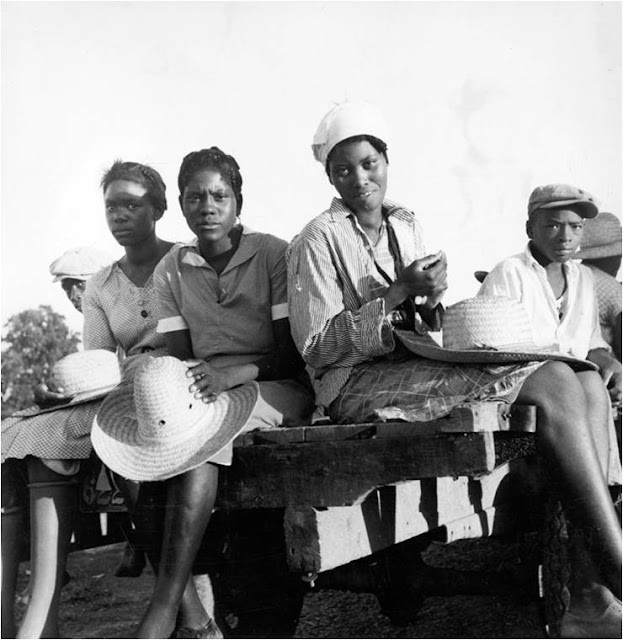 From Memphis, Tennessee to a plantation in Arkansas these young women can look forward to some desperately hot and hard work when they reach the cotton fields. They look as if they have had enough before they start but one manages a smile for the camera – despite the fact it looks very much like something quite sarcastic may have been coming out of her mouth at the same time. The young man on the right takes in angry and curious simultaneously. Lange did not restrict herself completely to the countryside. 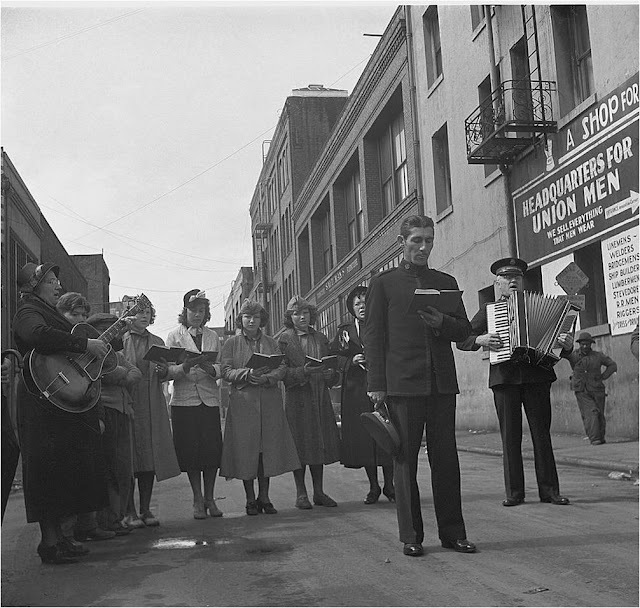 This was taken in 1939 in the Minna Street area of San Francisco. Back then we are talking skid row – today the area is becoming quite chic. As the Salvation Army did, a semi-circle is formed so that the crowd will position itself as a natural audience around them. War is coming – perhaps may of these young people found themselves wearing another uniform a few years after this. 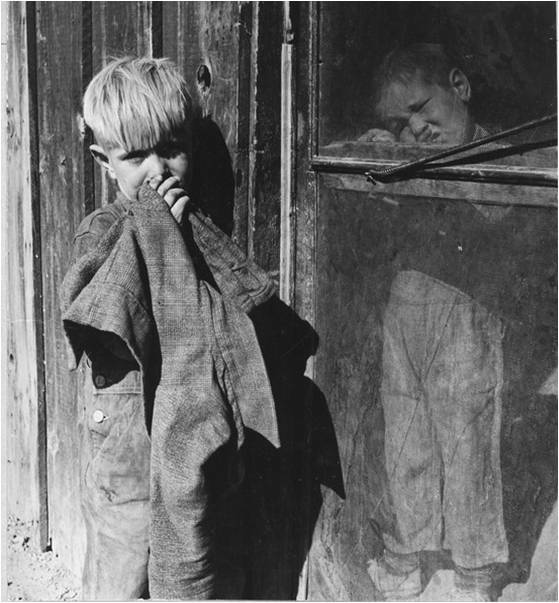 Look at the man in the right background – his filthiness shows the reality of poverty at that time. Something was coming, though. War. 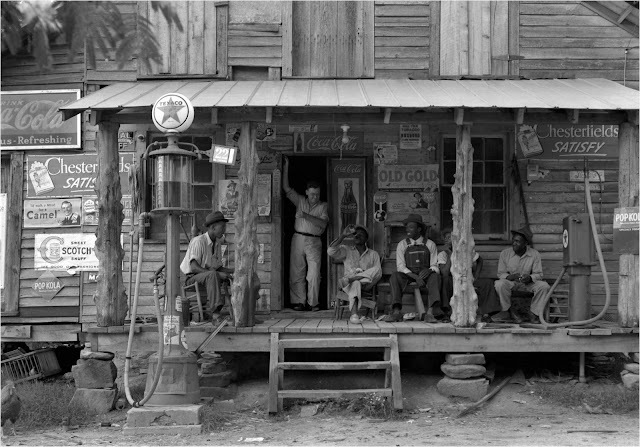 Lange’s images remind us of days gone by which bear still some resemblance to our own. Many of the issues she highlighted – particularly that of poverty – remain unsolved and possibly insoluble. They remind us that although we have come far in the intervening years we still have some way to go in so many ways. She went on to a position at the first fine art photography department at CSFA – the California School of Fine Arts and founded a photographic magazine, Aperture, in 1952. Lange died in 1965 and was inducted in to the California Hall of Fame by Arnold Schwarzenegger in 2008. 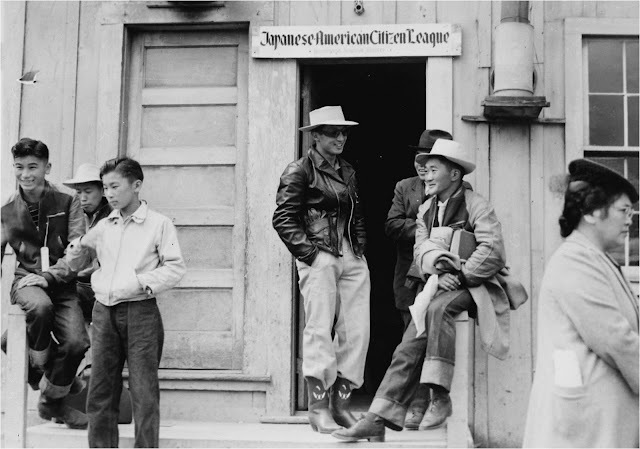 Lange also took many photographs of the Japanese-American community. They are such a remarkable collection that we will describe them separately in a future post. All pictures courtesy of Wikimedia.